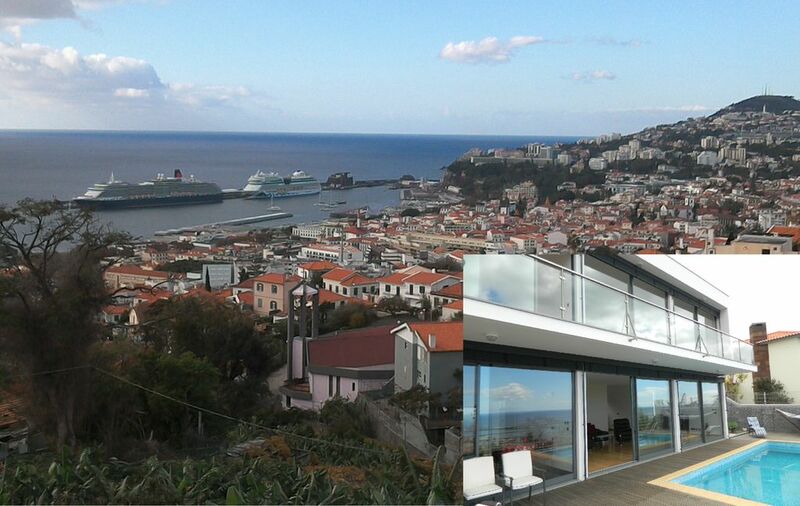 The very best views of Funchal from the harbour to the mountains from the lounge, kitchen and all 3 bedrooms. Modern luxury villa with heated infinity pool. 10 minutes walk (less than 5 minutes by car, taxi, bus) to the historic old town, town centre and seafront. Just imagine relaxing by your private pool with a cold drink watching the cruise liners arriving in the harbour, or dining at night gazing upon a golden Madeiran sunset, and later the beautiful twinkling lights of Funchal spread out before you. The house stands immediately above a lovely area of fruit trees including bananas, grapes, mangos, and figs ... a unique green area so near to the town centre.This amazing house comes with everything you need to make your holiday one to remember. Floor to ceiling sliding glass doors (with electric blinds) to the lounge, kitchen and 3 bedrooms give stunning views of Funchal in each room from all angles. There are very few houses in Funchal that give these amazing views from both floors. Large lounge with sofa, reclining massage chair, coffee table, dining table for 8, 50" HD TV (with Cable TV), DVD player and sound system. Access to poolside areas. Large modern fully equipped kitchen with American Fridge Freezer, Oven, Induction Hob, Microwave oven, Dishwasher, double basins, Kettle, Coffee/Tea maker, Toaster, Toasted Sandwich maker. Breakfast table for 4. Access to poolside areas. 3 Large bedrooms. Master bedroom with king-size bed, trouser press, en-suite bathroom with shower, spa bath, 2 basins, w.c. and bidet. 2nd bedroom with double bed. 3rd bedroom with 2 single beds. Each bedroom has large fitted wardrobes. Each bedroom leads onto the spacious balcony. The lounge sofa also converts into a double bed. Cot available. Upstairs family bathroom with w.c., shower and 2 basins. Downstairs cloakroom with w.c. and basin. Outside - infinity pool, seating areas, covered seating and dining area with table for 8, garden and large barbecue. Seats, sun loungers, hammock, clothes drying racks. Storage room with large washing machine. The swimming pool can be heated for an additional charge paid in cash on arrival. The heating should be requested at least one week in advance, should it be requested after arrival then the minimum charge applicable is one week which is payable from the time the heating is turned on. The weekly supplement is €150 to heat it to 24/25º. Cable TV to lounge. Fast Wifi throughout the house. 4G is also normally available. The garage has shared secure parking for 2 cars. Only the parking spaces are part of the rental as the owner may use the rest of the garage/basement for other purposes. The villa is about a 10 minute walk to the Old Town, the centre of Funchal, and the seafront. It is less than 5 minutes in a car or taxi (typically €5 fare). There is a Bus stop about 100 metres away with buses every 20 minutes. The public transport in Madeira is very good, and cheap tickets are available depending on the duration. Maria will be the host for your stay. She is Madeirian, has many years experience of hosting, speaks very good English and has a lot of local knowledge. We also have very good access to a local English speaking handyman who can quickly resolve any unexpected (and unlikely) problems. We enjoyed our stay on Madeira! Maria was super helpful and responsive. The house was very comfortable and the location was superb! We enjoyed sitting on the deck and even used the pool in March. Would definitely stay here again! Beautiful view on Funchal from the villa. The villa was clean, modern and verry comfortable. Everything was great. Thank you for your review. That just about sums it up. A fabulous apartment situated in the attractive suburb of Rochinha overlooking the port and centre of Funchal. Spacious and well-appointed with full-length southwest facing windows on both floors; an attractive deck surrounding a heated infinity pool and plenty of space for six - if not more. Watch the cruise liners arrive from your bed and celebrate the setting of the evening sun over the distant hills. One double bedroom has its own en-suite; the other and the twin room share another bathroom. The ground floor has a kitchen diner, plus a vast lounge with dining area. Below is a huge garage. the pool is heated. Rua da Boa Vista is a (VERY steep) hill and a 15 minute walk down to the centre, the market and many, many cafés, bars and restaurants. Forget about walking back - taxis (Funchal probably has more taxis per square meter than anywhere else in the west) cost between €5 and €7, and everyone speaks English. There's also a (no. 32) bus every half-hour or so. The local shops - five minutes away - offer basic provisions but anything else will require a visit to the well-stocked supermarkets in the town centre. A taxi can get you to the airport in 20 minutes... not that you'll want to leave. It was a great pleasure to stay in John's villa. It was beyond my expectations. Such a luxury! We have 7 person and we really enjoyed the stay there. Maria is very kind and helpful host, we received very warm welcome. This villa is interesting piece of architecture, interior design and decoration with the most breathtaking views. Everything is new and very clean. Great kitchen is fully equipped with high quality machines. The villa is located in a good place, 10 min walk to Funchal city center Av do Mar. The villa has a huge garage, so there is no need to worry about parking. WOW factors: Swimming Pool, Amazing Views, garage, space. Personally, I recommend villa to everyone who want to explore and relax in Madeira,Funchal. We are very pleased you enjoyed your stay and wrote us such a great Review. We delight in happy guests and would love to see you again any time in the future. Just returned from a week in John's beautiful house in Funchal. It was my first trip to Madeira and it was everything and more that people told me. It's a truly beautiful island, not commercialised, lovely people and food and John's place is ideally located to enjoy all that Funchal and the island has to offer. John was really helpful in giving us a travel advice, activities and was very responsive. His local contact (Maria) was absolutely first class and couldn't have done any more for us. The house itself has absolutely everything you need, fantastically fitted out, with amazing views over the town. I'm certainly going to return and would highly recommend the Island and John's house to anyone. We are really pleased that you enjoyed your visit and were kind enough to give us such a great first review. We look forward to seeing you again on your return.